An excellent educational DVD that covers the current water crisis in the African country of Mali and the city of Timbuktu. 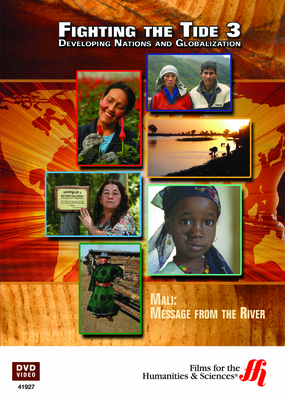 Mali: Message From the River covers the dramatic way climate change has almost destroyed the Niger River. As a landlocked nation, Mali (and specifically) the legendary city of Timbuktu, rely on the Niger river as their almost sole source of water. Timbuktu already resembles a desert (a process known as desertification) and the rest of Mali faces the same fate. The video humanizes this crisis by focusing on two different groups of people living in Mali: the Bozo and the Tuareg. The Bozo are a culture of fishermen who have relied on the Niger River for centuries for their livelihood. The Tuareg are nomadic pastoralists who are facing the loss of water from their desert oasis and wells. Mali: Message From the River delivers a powerful message regarding the effects of climate change in the developing world that viewers elsewhere can not afford to ignore.